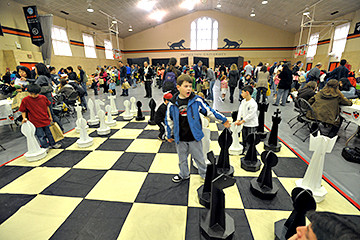 ON BOARD FOR WONDERLAND: A giant chess board was one of the features at Saturdays Alice in Wonderland event at Dillon Gymnasium. For this years version of Cotsen Childrens Librarys Princyclopedia, where a book is brought to life through various hands-on projects and activities, people of all ages took tea with the Mad Hatter, went on a snark hunt, hung out with the Cheshire Cat, and tested their skills on this giant chess board. Borough Council and Township Committee accepted most administrative recommendations regarding joint agency operating budgets at a special meeting last Tuesday. Capital budget requests by joint agencies were not discussed. The Princeton Environmental Commission heard a report last Wednesday from spokespeople for the Westerly Road Church regarding the churchs proposed move from its present location to the Princeton Ridge area along Bunn Drive. Commission member Steve Hiltner also announced that the Environmental Resource Inventory is complete, and will be presented to the Planning Board on May 7. Over 100 people turned out on Sunday afternoon for the Princeton Coalition for Peace Action (CFPA) forum, Intro to Afghanistan, held at the Unitarian Universalist Congregation of Princeton. The two-hour program included six speakers offering perspectives on the history, regional politics, geography, and culture of Afghanistan as a backdrop to President Obamas proposed troop escalation in the area. Last Fridays announcement by the president, indicating that would he send some 4,000 additional troops to Afghanistan, while leaving the door open to send more as the situation warrants, lent particular urgency to Sundays event. Subject to an administrative hearing, Borough Policeman Garrett Brown is accused of serving alcohol to minors at a party in Keene, New York in October 2007. The hearing commenced last Wednesday, and is scheduled to continue on April 16 at 9 a.m. in Borough Hall. Times may seem tough now, but Princeton scholar Uwe Reinhardt says that things are going to get a lot worse unless something is done about our health care system. Adroitly managing to speak with both the utmost seriousness while keeping his tongue firmly planted in his cheek, the James Madison Professor of Political Economy recently described the growing numbers of uninsured Americans as dark clouds coming from the right in a talk entitled Health Care Sails Into a Perfect Storm: Can Obama Come to the Rescue? at the Woodrow Wilson School of Public and International Affairs. It wont be the same on the sidelines for the Princeton High girls lacrosse team this spring without longtime head coach Joyce Jones running the show.